A Westminster committee is to hold an inquiry into deep cuts to RHI payments. The NI Affairs Committee hearings follow complaints that the legislation, fast-tracked through Parliament, did not receive sufficient scrutiny. The cuts would bring payments for the most common boilers here from around £13,000 to £2,000 - the second time they have been slashed. 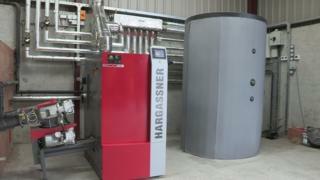 Some businesses with boilers said it would hit their cash flow and threaten their viability. Northern Ireland's botched Renewable Heat Initiative helped collapse the Stormont institutions. An overgenerous subsidy and poor monitoring of the 20-year scheme saw subsidy payments outstrip the budget, creating a potential overspend of £490m for the Northern Ireland budget. It took a series of deep subsidy cuts to bring it back in line, angering claimants who cited a letter from former enterprise minister Arlene Foster to the banks that payment levels were guaranteed for 20 years. Image caption Committee chair Dr Andrew Murrison said changes to RHI payments required "proper scrutiny"
Chair of the committee, Dr Andrew Murrison MP said: "Businesses across Northern Ireland have structured their finances on the very reasonable assumption that RHI payments were copper-bottomed. "While the Renewable Heat Incentive scheme can hardly be regarded as a wholly successful policy, righting its wrongs requires proper scrutiny." The Department for the Economy defended the new rates, saying they kept the scheme compliant with EU rules on financial support for businesses. It said many businesses who invested up to £40,000 per boiler have already recouped their investment just a couple of years into the long-term scheme. Had the changes not been made it would not have been legal to keep making payments, it said. MPs reluctantly approved the legislation but, with it being dealt with in just one Commons sitting, complained that it had not been sufficiently scrutinised. It is likely that senior officials from the economy department will now be called to explain the decision. In particular, the committee is likely to focus on claims that an equivalent scheme in Great Britain is much more generous - something that is likely to be contested. It is understood that's based on data which shows that boilers were more expensive in GB than in Northern Ireland, fuel costs were greater and boiler usage was lower, requiring a higher subsidy to get claimants to the EU-approved 12% rate of return on investment.